Theodore McConley of Mineville, New York recently received the Jubilee Medal Award from the Embassy of the Russian Federation. Eight years ago “Ted” received a letter from the Russian Embassy asking him if he was the same person who guarded the supplies for the Russians in WWII during the periods of 1944-1945. Ted lost the letter and forgot about the inquiry. 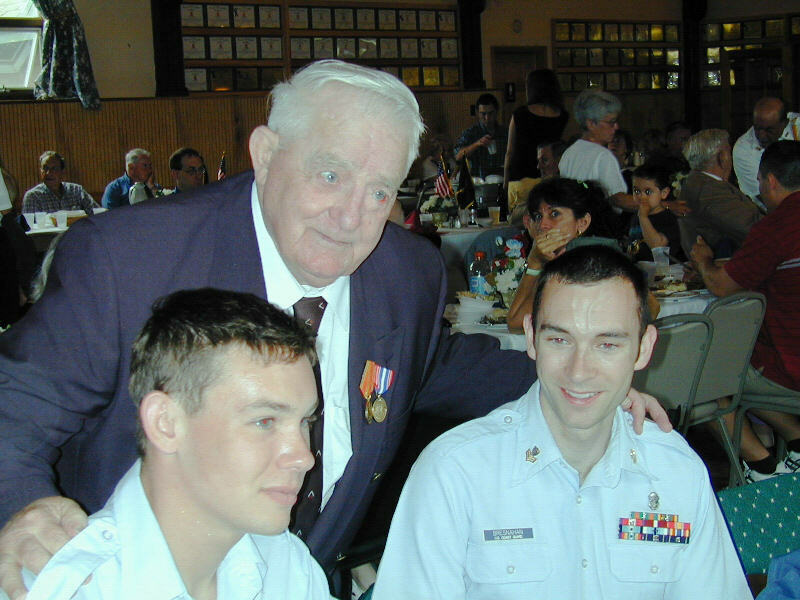 In December of 2005, a friend of his inquired of the medal to the Russian Embassy to which a reply was received, later followed by an envelope containing the Jubilee Medal. 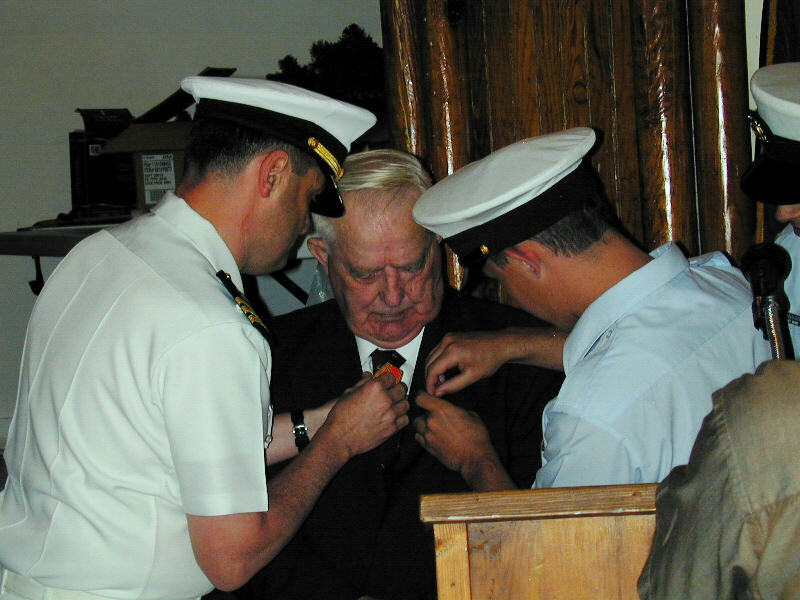 The medal awards were established on July 7, 1993 by President Yeltsyn. The Jubilee Medal and all paperwork received with it are written in Russian. With the help of Judy Olinick in the Russian Department at Middlebury College, the translation gave sense of what the medal was about. The 50th Anniversary of the Victory in the Great Patriotic War of 1941-1945 medal was conferred to all living veterans of the Patriotic War who assisted with transporting supplies into Russian ports and was given as a symbol of appreciation from the Russian government. 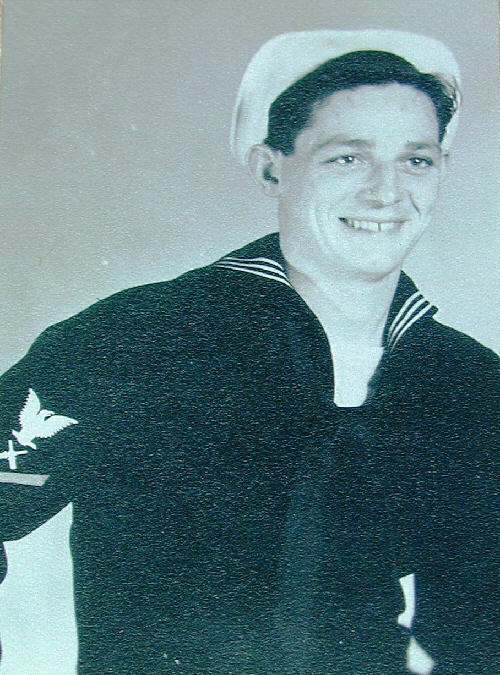 Ted was trained at Little Creek, Virginia as a Navy armed guard gunner and later assigned to a Merchant Marine Ship that was carrying cargo to the Russians in combat. 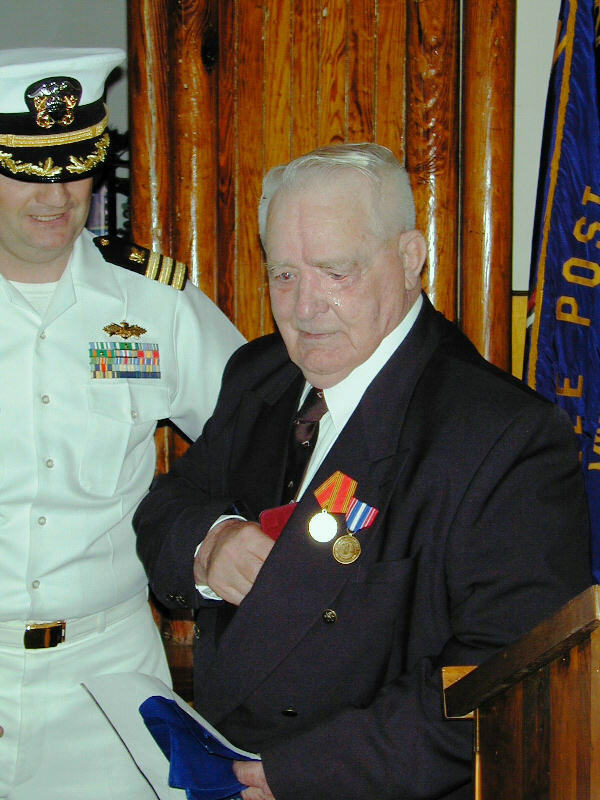 His first assignment was to the SS Charles M. Conrad, a liberty cargo ship that carried a crew of about forty four and twelve to twenty five Naval Armed Guards, who were the luckier ones to make safe passage to and from the Soviet Union. He later served on the SS John Hopkins, the Esso Annapolis tanker, both of which have been since scrapped. From Virginia to the Russia, where the soldiers came to the riverbank docks with trucks to unload the supplies, was Ted’s first successful tour. The route went through the Mediterranean Sea into the Suez Canal, into the Red Sea and down into the Gulf of Aden, progressing to the Indian Ocean and then to the Straits of Hormuz, finally coming to the Persian Gulf and then up the Uphrates River. Ted, who is known for his abilities to train and race horses at Saratoga and all over the northeast, can now be known for the best-kept secret, serving his country. A formal Award Ceremony is being planned for May 29th, 2006 at the VFW Post in Mineville, New York with a chicken barbeque following. The public will be more than welcome. Ted with Fireman Sean Mullane & Darrell Dresnahan, BM 1/C, US Coast Guard, Burlington, Vt.
World War II "suicide squad" that protected cargo ships from Axis forces. Mineville Veterans of Foreign Wars hall. supplies to Russian troops stationed on the Euphrates River in 1944. Along the way, he faced German U-boat attacks and strafing from enemy warplanes. its way to resupply Russian troops stationed in Turkey. "We were the gunners trying to get the ship through and get it home again,"
McConley said. "We guarded merchant ships. I served on a lot of ships." The Naval Armed Guard was a division of the U.S. Navy that served aboard U.S.
members, 1,800 were killed in action. their trucks and take the stuff away." He said there was no city nearby, so the trucks must have come a long distance. recognition. Nobody documented the air raid that day." That's generally how it went with the Naval Armed Guard, he said. during World War II but not the Naval Armed Guard, he said. McConley went all over the world with the guard. carriers in the Mariana Islands and the Carolina Islands." "We'd just got our mail at the post office. Then it blew up." That was in August 1943, after Italy had surrendered to Allied forces, and U.S.
Army troops who were there that day were awarded the Bronze Star. "We didn't get the Bronze Star," McConley said. "We were in the Navy." 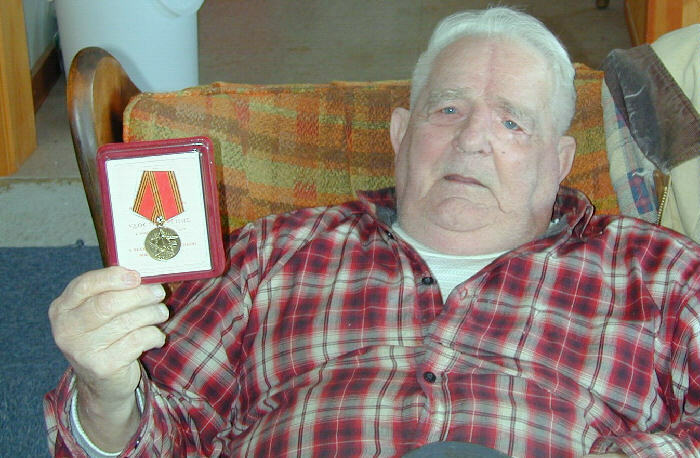 veterans like McConley the newly created U.S. Navy Armed Guard Service Medal. War II," Larsen said in a news release. recognition with a special medal." The bill has been referred to committee for further action. Navy and found he was due the awards. 6,000 ships during World War II. "The Navy called us a suicide squad," he said. "We were forgotten."